Women’s Banjo Camp–WOW! WOW! WOW! Casey and I are excited and proud to say that our first-ever women's banjo camp was a tremendous success! We had 18 women and 4 of these were young teens. I came away with a new nickname--AJ--for "Alpha Jammer" and Kathy Hanson was tagged "AJ Jr" for her outstanding leadership in the late night jams (which went on until 1 am on Friday and ended earlier, midnight, on Saturday!). I was dubbed "AJ" after Casey and Janet and I did a Friday afternoon session on How To Jam. (This will become a standard Friday event at all our camps from now on.) This was more than just a "jam etiquette" session. We talked about "friendly" or "nice" jams and demonstrated what might happen there and we also talked about "not-so-nice" jams or "unfriendly" jams and demonstrated what might happen there. Note: Many jams are not "unfriendly" on purpose--these are higher-level jams, often with seasoned players, who most always play fast, who know harder songs, and who don't cut newcomers any slack because they don't want the jam to be anything other than "top notch." Players assume other players will know the material so songs are often not even named--they are simply kicked off. You are expected to know what the song is AND THE KEY IT IS BEING PLAYED IN. I got my nickname when I was demonstrating this "fast jam" procedure. I kicked off Roll in My Sweet Baby's Arms as fast as I could play it without announcing the title. It was in the key of A which caused Janet to have to scramble for her capo. (Note: if a major player starts putting on her--or his--capo in a jam, it's a safe bet you are going to be playing in a different key! Get ready!) Of course, Casey knew the drill so she was totally able to come in singing the chorus with me right after I finished the kickoff. I also might have gotten the nickname because I admitted to actually liking some aspects of these fast jams! And for saying that I always wanted to be the only banjo player in a jam! It's your turn to pick a song, Casey. Ok, what about Shenandoah Breakdown? Does everybody know that? No, I don't play that one. Okay, what about Daybreak in Dixie? I do it in A. (Mandolin player): Oh, I learned it in G. I can't do it in A.
Casey: Well, I can do it in G. Is that okay with everybody else? Nods all around and the song gets played. And afterwards, the next person picks the song. Whoever kicks the instrumental off is the one who ends it and puts on the ending lick. For anyone else to do this is rude. For singing songs, most jams want only the three basic vocal parts: Lead, tenor, baritone. Don't sing along if the part is already covered. If you are new to the jam and you get the nod to take a break, DON'T PASS IT UP. Even if you can't play something very good, at least play something! You might get one more chance, but if you pass up a break twice you are not likely to get asked again. After our demonstration (which also included some jam session "role playing" by Martha and Susan), Casey and I were both worried that we had scared everybody off with too many rules and regulations! And these "unspoken" rules can be confusing when thrown at you all at one time. But afterwards, the women said they had really enjoyed the session and almost all of them felt it was better to be forewarned! Of course our jams at the camp--with 18 banjos--were completely different from what we took to calling "real" jams. We usually had all the banjos playing the breaks together and we WELCOMED everyone singing all the time on whatever part they could sing. Lynn Morris was kind enough to drop by for lunch on Saturday. She mixed and mingled with the women there and I everyone was honored by her presence. We gave her one of our "Pick Like a Girl" T-shirts and she put it on and had her picture "took" with the rest of us. I gave her a copy of my book Pretty Good for a Girl because she has a whole chapter in it. She is truly one of the pioneers in bluegrass and I admire her so much. Friday night Casey and I showed off the playing of our local women with an hour-long concert. Participating were: Kathy Hanson, Kathy Holliday, Kristina, Kasey Smelser, Barbara, Janet, Casey Henry, and moi. Did it go off without a hitch? No it did not, but the hitches were small (although I'm sure they didn't seem small to the hitchees) and I was so proud of everyone for being willing to be up there in front of a crowd giving it a shot. The audience responded enthusiastically and I thought Ben Smelser was going to swoon with pride when Kasey was singing I Saw the Light. Kasey said she even got a compliment from her brother who said, "Good job." She was ecstatic over that! I'm totally out of time to say more if I'm gonna eat my oatmeal and take a shower before my teaching day starts. Let me close by saying THANK YOU to all the wonderful women who came to the camp. Thanks for making it a success. I think there was a whole lot of bonding going on, and being a woman myself, I liked that! And a special thanks to my totally awesome daughter Casey who came up with the idea for these camps to begin with and who shoulders the lioness's share of the detail work which I abhor. Couldn't do it without you, Case! You are the woman! See all y'all next year. And don't forget our Mixed Gender Beginner's Camp October 25-27, 2013. Posted in banjo, By Murphy, jamming, Singing and tagged women in bluegrass, women's banjo camp on July 23, 2013 by Murphy Henry. I know it's last minute, with the dates for the Women's Banjo Camp being July 19-21, but we have scholarship money available for one young woman, age 8-22. The scholarship would cover camp tuition only (it does not cover lodging) but still, it's a chunk of change! ETA: Thanks to an anonymous donor we now have TWO scholarships available. I hope and suspect that we will get more than one name, and if we do we will number the entries in the order received, put all the numbers in a hat and have a drawing for the lucky winner. The number will be chosen completely at random and neither Casey nor I will do the drawing. We will draw for a winner on June 28 and will contact the winner as soon as we draw. So, again, please include contact information. If in any event the winner cannot attend or has to drop out, we will draw again. So you've got two weeks and a half to send in your suggestions. The camp is being held here in Winchester, Va., at the Courtyard Marriott. We start Friday, July 19, at 1 pm and finish up Sunday, July 21, at 1 pm. 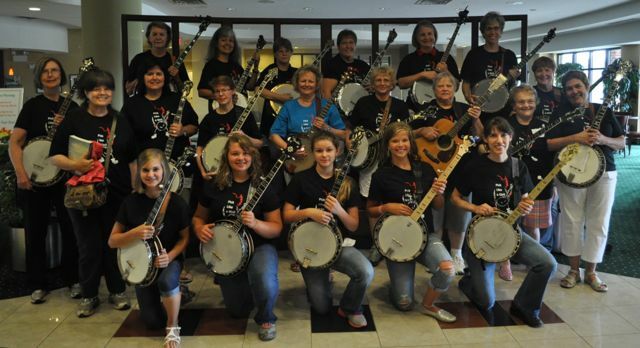 We are soooo looking forward to our first All Women's Banjo Camp! Who knows where this may lead???? Posted in By Murphy, Camps and tagged women's banjo camp on June 10, 2013 by Murphy Henry. As you will be reading in our next Newsletter (coming soon!) Casey and I have decided to do a Women’s Banjo Camp. It will happen next July 19, 20, 21, 2013, here in Winchester and we are really excited about it! It will be for all levels of banjo-playing women, beginners through advanced. We welcome younger women and we welcome older women. Part of our reason for doing this camp is to make a real effort to get more women to attend banjo camps—any banjo camps, not just ours. We know there are women out there who are learning to play the banjo, but they don’t often show up at camps. A few do, but not many. So we thought perhaps a women-only environment would seem less scary. If you’re going to fall on your face playing the banjo, somehow it seems easier to do amongst a group of women! And we’re hoping if they have a good experience at our camp, this will give them the encouragement they need to attend other camps. So, please help us spread the word! And feel free to write (themurphymethod@gmail.com) or call (800-227-2357) us with any questions. And, although we didn’t exactly plan it this way, the camp will coincide with the publication of my book, Pretty Good For A Girl: Women in Bluegrass, by the University of Illinois Press. (Which also published Neil Rosenberg’s classic work Bluegrass: A History.) My book is scheduled to come out in June 2013. As I’ve mentioned, I worked on it hard—but somewhat intermittently—for TEN years! So I am ecstatic to have it out of the house and in the hands of the publisher. I will really feel like it’s done, of course, when I’m holding my first copy! And, if all goes well, we should have copies for sale at our Women’s Banjo Camp next July! Posted in banjo, By Murphy, Camps, women in bluegrass and tagged women's banjo camp on July 12, 2012 by Murphy Henry.